This pack contains over 6 hours of hyper turbo strategy, from a top coach and player in hyper turbo husngs. Topics such as population tendencies are covered in great depth, or how to play against an unknown opponent early on in the match with no information. The topics branch into how to make bayesian type decisions as information starts to become available, and eventually into adjusting and exploiting your opponent's specific characteristics. There is a great deal of focus on questions from $10-100 level hyper players in these videos as well. To make it easier to study outside of the video, we've included spreadsheets and chart images with each purchase. Greg has been playing poker professionally since 2007. 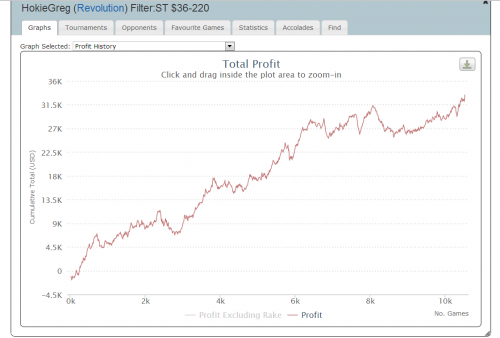 His screen name on PokerStars was HokieGregHU and his screen name on Revolution is HokieGreg. Prior to Black Friday, Greg was playing turbos up to the highest levels Stars offered. After Black Friday, Greg switched to hyper turbos. Below are his hyper turbo results that covers the last ~9 months. "Readless" Play: Hokiegreg defines population tendencies and reviews their practical use in-game. Greg also reviews some pre-made sample population tendencies for unknown players. These population tendencies are the basis for the default ranges throughout the rest of the class. Bayesian Estimators: Greg reviews how to combine small samples of hands versus individual opponents with population tendencies. 'Bayesian Estimator' is kind of an intimidating term, but it is relatively common sense actually. Greg makes this complex yet important topic a little easier to understand by reviewing a few examples. Maximally Exploitative Play: A few common HUSNG myths are debunked before moving forward. Small Blind Default Ranges and General Adjustments: With significant reference to population tendencies, Greg looks at several charts at a variety of stack depths. He specifically focuses on how to play better than NASH vs the population 3BB deep to mr/calling ranges at 25BB. Additional discussion includes: When and why we should limp weak hands vs passive opponents, how to adjust versus aggressive 3-bettors and how to adjust versus very passive and/or nitty opponents. Big Blind Default Ranges and General Adjustments: Again, referencing population tendencies, Greg reviews more charts covering all possible stack depths. Additional discussion includes: 3bet bluffing "readless", adjusting our flatting range vs varying opening ranges, and a brief review of limp raising ranges and sizings. Day 2 consists of numerous hand examples, math explanations, and more emphasis on using population tendencies to our advantage. C-Betting: Greg discusses how to use cbet sizes to setup profitable stack to pot ratios (with hand examples at multiple stack depths). Also, there is a focus on cbet and barreling math. Barreling: Greg focuses on how to barrel differently vs regs and fish and the math behind this. ValueBet sizing: During this time discussion covers optimal value-bet sizing. Greg touches on why we do not automatically maximize value simply by getting called more often. The video also includes examples of value-betting the river with 3 different sizes and the math behind it. Facing C-Bets/Barrels: To help with this, Greg has extensive population tendency discussion. He discusses how to adjust our OOP strategy for nittier or more aggressive opponents. He does this with hand examples and conceptual discussions. C/R Bluffing + Barreling: Greg will show how often a c/r bluff needs to work with different sizings. This will be based on population tendency + gameflow discussion. He has a few hand examples discussing continuing or shutting down our bluffs on the turn. Playing draws oop: Greg shows several hand examples at different stack depths. He focuses on deep stacks vs regs who usually have a wide cbet and deep vs fish who often have a tight cbet. There's also focus on shorter stacks vs either opponent. On Day 3 Greg reviews several games in the PT4 hand replayer with heavy emphasis on proper use of the CoffeeHUD. The first few matches reviewed have very small (or no) sample sizes vs our opponents. There is a heavy focus on population tendencies early on in the matches and bayesian estimators are used to adjust as sample sizes vs our opponents grow. The last match reviewed is against an opponent that we have a much larger sample size against. This will allow more specific adjustments to the individual opponent, as opposed to playing against the population. In the first two bonus videos, HokieGreg reviews hands against different villains. He discusses his range for calling all in 3bets against opponents that shove frequently. In the bonus videos three and four, Greg does a session on his charts to break down the best action based on your hand, position and stack depth.